Check out the latest Apple iPhone ad called "Parenthood"
Apple has started running a new commercial for the iPhone that it created in-house. Named "Parenthood," the 60 second spot shows how the Apple iPhone 5s can be used as a tool to help parents interact with their kids. The handset is used as a video baby monitor, a thermometer for taking a child's temperature, and a video camera to film some of the wonders of nature. Even when Mom is away on a business trip (well, that's what she told Dad anyway), she can help tutor Junior with his math through the use of flash cards and FaceTime. And an iPhone mounted on the handlebar of a stroller, helps Mom measure the amount of exercise she is doing while pushing her twins up a rather difficult trail. The spot seems to be the perfect sequel to the most recent ad from Apple, that showed how the Apple iPhone can be used to help users stay in shape and monitor their health. A website that ties in to the "Parenthood" ad, provides a breakdown of each feature used in the commercial, including links to the third party apps employed. Other links take you to information about the native applications used, such as FaceTime. 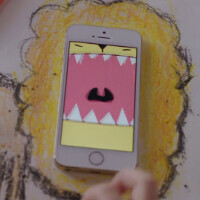 To check out the latest iPhone commercial, click on the link below. No. If you need a cell phone to tell you how to be a good parent, then you shouldn't have kids in the first place. I think it highlights Apple's strong point in focusing heavily on clear, accessible design in both hardware and software. As a parent carrying out a lot of work and juggling all that and the kids, playing around with an OS at a system level doesn't matter as much as getting things to work right. Problem is people pretty much know now that all platforms more or less can do what they showed in the ad. The differentiating factor isn't shown at all, which in Apple's case is now restricted to their ecosystem cohesiveness. All they showed was an iPhone doing remedial things that could be done with even Blackberry/Symbian phones. You do know they still have to market their products right? I also saw a little hint on Homekit. Well, Android, not so sure about WP. I hate current Apple ads, so lame and cheesy. Such a complex response requires an equally intellectual question, SO? Personally I don't like ads at all but I'm curious to know what was cheesy about this one? Well, this one is not that bad. Apple does it in retina display - beat that Android! Being a parent, and also an Xperia Acro S user... this was the first thing that came to mind with the ad... all I see was at least 2 iPhone 5s ruined by salt water and tap water... Last weekend on the other hand I had a great time at the beach and pool, taking pictures and video of my family and having my almost 3 y/o toddler learn to hold its breath underwater for a few seconds... GREAT PICS! Nevertheless, they are still late for 2 damn years. I don't like Apple's commercials ever since they started creating them in-house instead of using TBWA/Media Arts Lab as they usually do. Much better are Samsung Galaxy S5's ads. These are nothing that I can't do with my Note 3, or even my Epic Touch.